In central Vermont you have to drive to get just about anywhere. In high school, once I had my own car, I built up a mental map of roads good and bad, this giant web linking my house, my school, my friends’ houses, my mom’s work, my dad’s house, my dad’s work. There was this one road I’d often take when I was in a hurry, an unmaintained dirt road that went over a steep hill and turned the hour trip from my house to my dad’s house into forty-five minutes. Last summer I was in Vermont to visit my dad and I thought it would be fun to try out that road, to see how well my mental map had stood up to twenty years of decay. Well, the road had gotten worse, and the rental car got hung up on some ruts just as I was coming to the top. There were no bars on my cell phone so I got out to walk. It was nice out but the summer warmth seemed far away over the trees. It had been a while since I drove past anything so I decided to keep walking the way I’d been driving. After a minute or so I came to a big house that looked like some rich out-of-stater’s third home. Not a summer home, apparently, at least not this summer. It was locked up tight, with no cars around, and nobody answered my knock. So I kept walking. I had forgotten part of my mental map after all. The Strigil Institute sign had been one of my old landmarks, one of those places I’d notice whenever I passed them driving around, like the odd “Guns & Clocks” store between my house and dad’s work, the witch-windows on certain houses that maybe I found more interesting than they actually were, or the granite whale tail sculpture I’d see on the way to the dentist’s office. This inexplicable “Institute” had once been a personal landmark but I’d totally forgotten about it. I wondered why I’d never stopped before, turned off and seen if visitors really were welcome. Maybe it was the same reason I never bothered to go shopping at “Guns & Clocks”, or maybe it was because I was always hungry driving to dad’s house, eager to get there and eat a snack. But now I wasn’t hungry, and I couldn’t leave anyway, so I headed down the driveway to check the place out. The driveway was about a quarter mile long, curving and dropping a bit so the Institute couldn’t be seen from the road. When the trees opened out and I saw the place I laughed. The name was pretty grand compared to the reality. The Institute was a grey building in a sloping field of waist high grass. There was a spot in front where the grass was tamped down with an old fire pit in the middle. A bunch of crushed and faded beer cans lay in some powdery cinders. There probably hadn’t been a party up there for years. Behind the building the field fell away to a mass of black locusts. Before they’d grown up the place must have had a great view of Tucker Mountain, and the view was still okay, around the edges of the thorns and branches. The building, the Institute, I guess, was sort of peculiar. It had an irregular shape: squat and cube-like in the center with a taller, pointy wing to the left, and the outside was all vertical grey clapboards. You sometimes see weird buildings like that in Vermont, designed by architects wanting their work to stand out from the old farmhouses. It was obvious there was nobody there. Obvious, too, that there was no electricity, no phone. My cell still didn’t have any bars. There had been a cell phone tower installed a few years back not too far from there, disguised as a comically oversized pine tree, but I guess I was on a different network. The front door stood open a few inches. I stepped into what I guess you’d call a lobby. It felt like a doctor’s office, with some vinyl chairs sitting across from a divider desk. It smelled like mold and leaves and clearly many squirrels had lived in there. They’d stuck bundles of dead leaves everywhere. The floor was spongy in a way that made me nervous, rotted carpet over plywood. There was a kitschy painting on one wall, a covered bridge that could have been by Thomas Kinkade, but instead of specks of light it was covered with blotches of mold. I had a queasy feeling of seeing into a place that I shouldn’t, not just that I shouldn’t have been there because I was trespassing, more that the place itself shouldn’t have existed. Buildings aren’t meant to be in ruins like that. It was somehow embarrassing. It made me angry, I couldn’t really say why, and I decided I would steal exactly one thing from the Institute. The painting was an okay choice but I was sure there’d be something better in the back. I took each step deeper in the building slowly, not wanting to fall through the rotten boards into who knew what. The area behind the desk was full of water-damaged magazines. The Institute had subscribed to Reader’s Digest and Time. An inner door headed deeper into the Institute. I kept thinking of that pompous name and grinning to myself. I guessed the Institute had probably been founded by some hippie who hadn’t quite understood the strange makeup of Vermont, who had thought maybe they could interest some dairy farmers in whatever new-agey nonsense they were peddling. Beyond the reception desk it was pretty dim. Just a little light came in through a skylight that was full of leaves. I waited for my eyes to adjust, and was glad I did, because I realized I was standing on a balcony overlooking some kind of sunken space. I couldn’t see how long the drop was, probably not that long, taking into account the slope of the hill, but it wouldn’t have been fun to lean on a rotten balcony and find out the hard way. It smelled like the worst musty basement in the world down there and didn’t seem safe at all, so I edged around the balcony to the left, through another interior door and into what I thought was the wing I’d seen from outside. The whole wing was piled to the ceiling with bins of junk, milk crates stuffed with papers, garbage bags full of clothing, or maybe they were tapestries, who knows; anyway it was yards and yards of thick burgundy fabric. The air was stifling. The smell was worse than the musty well, mostly sweet but with a truly foul note. The room I was in had been a kitchen, judging by the Formica counter and the cabinets. A big binder sat on the counter. Handwritten on the front of it was “The Strigil, An Apology.” I was starting to feel sick to my stomach. I grabbed the binder and flipped through it. It was full of pages from a dot matrix printer, a little wrinkled and speckled with brown but mostly legible. I saw something about the physicist Richard Feynman, which almost cracked me up again; I’d been obsessed with him as a kid and must have read his book “Surely You’re Joking, Mr. Feynman” half a dozen times. The binder was mine. I got out of there. The fresh air outside was like a celebration. I went back to the car, ended up walking an hour further along the road through the woods until I crossed the boundary into the town where my dad lived, where the road was maintained and where buildings existed other than extra vacation homes and abandoned hippie’s follies. Someone let me use their phone and I called my dad and he came with his truck to help me get the rental car off the ruts. A few days passed. It was a normal visit. I didn’t get a chance to look inside the binder until dad was away on the last evening of my stay, busy with his new hobby, Scottish country dancing. I went out to the car and brought in the binder. The pages, still smelling a little sweet, laid out the whole story of the Strigil Institute in pretty uncomfortable detail. The founder of the Institute, whom I’ll call “W.”, went to UVM in the late 1980s. He studied physics and philosophy. He abandoned his doctoral program, though not his obsessions, and came south from Burlington to live on some land owned by his family. When his parents died, he used the money he inherited to build a house, which he eventually turned into the Strigil Institute. Apparently the idea of the Strigil itself came to him in a dream. He heard only the name at first. It was named after a tool used in the ancient world for scraping dirt off the skin. After a month of dreams that echoed with the name, he dreamed an image of the Strigil itself, and in the morning when he woke up he opened his toolbox and gathered what he needed and built the thing. The birthplace of Joseph Smith, who founded the Mormon Church based on information from a vision, is only an hour or so away from the Institute. Maybe W. saw something of Smith in himself. He tried to attract students to the Institute to study the theory of the Strigil, and even caught a few, tempting them with a gorgeous view and a sunlit meditation room and red robes to make them feel like initiates into something special, but nobody stayed for long until K. When K. came to the Institute he and W. figured out how to make the Strigil work. It seemed there was a human element necessary to turn a thing from a dream into a working device. The Strigil was powered in some way by curiosity. W. tried to explain what the Strigil could do with the aid of a metaphor he borrowed from Richard Feynman. He went so far as to claim that Feynman must have dreamed of the Strigil too but hadn’t dared build it, though that’s beside the point, I think. Feynman’s metaphor was the inside of a brick, the question being, does the inside of a brick exist? Because, of course, you can’t observe it; break a brick in half to see its interior and all you’ll see is two new surfaces; all you’ll get is more “outside” and you’ll be no closer to any “inside”. W.’s Strigil was a device which solved this paradox, a metaphysical “scraper” which could slice away the exterior of an object and reveal its interior to the naked eye. Once they had the Strigil working, W. and K. disagreed about what they should do next. W. wanted to bring more students in, while K. was content to experiment further with just the two of them. In the end K. won by default. Their sign welcomed visitors but nobody ever came by. Alone, they scraped exteriors away to look inside stones, logs, crystals, apples. The Strigil ran hot with their curiosity and K. convinced W. that if they kept using it to look inside such mundane objects it might burn out before they observed anything of importance. They agreed to perform a final set of procedures. W. going first, followed by K., each would use the Strigil to scrape away the outer metaphysical surfaces of their faces, revealing their true selves. W. went on to explain that they tried to record the results of their procedures with a Polaroid camera but the photographs they took of one another were also false. “They captured none of the clarity we had achieved.” So K., who painted in his spare time, did a portrait of W., depicting his clarity as faithfully as he could. W. drew a picture of K. but he was unskilled and the portrayal was unsatisfactory. Afterwards, W. wrote, K. grew distressed, and took the Strigil and Polaroids and both portraits “down to the container.” At the time of his typing the Apology, W. hadn’t talked to K. for several days. I heard dad’s truck pull into his driveway and I put the binder away. He made us some steaks, bought very cheap as a “manager’s special” from Shaw’s. When I went to bed that night in the loft where I used to sleep as a teenager, visiting dad on alternate weekends, I thought of what W. had implied in his Apology. There was somewhere I hadn’t seen up at the Institute, maybe the most interesting place. So I stopped at the Institute on my way back to the Manchester airport the next day. It was hotter than the day of my first visit and the field below the grey Institute building was humming with insects. I pushed down through the grass to the trees’ edge, looking for what W. might have meant by the “container”. It was clear when I found it: a trailer, maybe belonging to an eighteen wheeler, set up on cinder blocks and tucked away in the trees. The door at the back was closed. I forced it open. It stank inside, even worse than the house. Everything was jumbled and of course it was dark. My cell phone didn’t have any bars but its flashlight mode worked so I made my way back into the container, past boxes full of more burgundy cloth, past heaps of crude clothing sewn from the material. I found a sleeping bag at the very back of the container. An old dead body lay inside it. 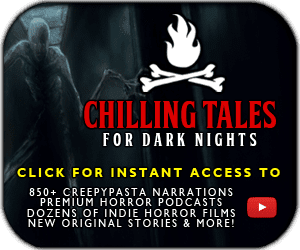 The flesh had rotted away leaving just bones inside a stained robe. The skull was wrapped with a filthy sheet. It was K., I supposed. Some scraps of torn photographs were near the bag. I tried to piece them together for a few minutes but I didn’t really need to complete the puzzle to see what the photos were of: two men with the skin and meat scraped off their skulls, blood-flooded eyeballs staring at the camera. W.’s sketch of K. was there, a human form whose face was filled with tiny jagged scribbles like you might doodle during a boring meeting at work. K.’s portrait of W. was far more elaborate. W. wore a dark red robe, and his face had opened like the covers of a book, revealing what K. saw inside W.’s head, swirls of color like a nebula being sucked into a black hole or a bunch of orchids all blending together or a spiral of bright frills and fronds like a mass of sea anemones. The Strigil was there too. It was laughable, clearly the work of someone seriously deranged. The handle was thick beige plastic. It looked like the receiver of an old rotary phone that had been cut in half with a hacksaw. At one end was a chunky electric plug, at the other a curving metal blade like a shoe horn. Copper wires had been wrapped in little bundles and glued to the base of the blade, running down into the handle. The workings were sealed with blobs of caulk. It had a nice weight in my hand, though. The Strigil itself was obviously a better souvenir than the Apology. On the way back I stumbled over another red-robed skeleton hidden in the deep grass. I guess it was W.
I made it to the airport and dropped the car off okay. I expected the TSA to confiscate the Strigil but maybe it looked like something else in my luggage, or like nothing at all. When I got home to Nashville I plugged it in. I sort of hoped it wouldn’t work but it hummed and I could feel it trembling in my hand. My curiosity burned like a mulch fire. I looked inside stones, logs, crystals, apples. A lot of truths are still hidden from me, but hopefully not for much longer now. 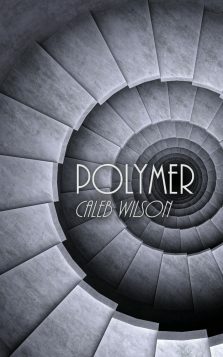 Check out Caleb Wilson’s action/adventure horror novella, Polymer – described by the author as a cross between Castlevania and Purple Rain – now available on Amazon.com.